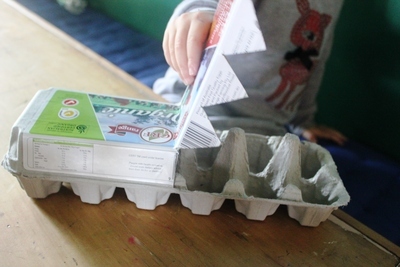 We had a growing stockpile of discarded egg cartons in the corner of the pantry and something just had to be done. 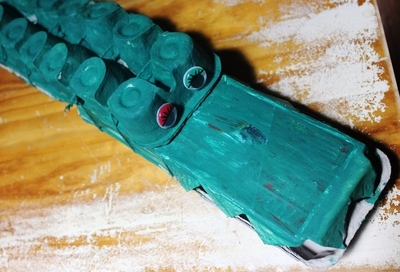 So, we hatched a plan to build our very own snappy green crocodile. 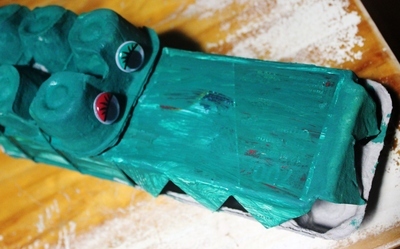 This egg carton crocodile is a perfect way to recycle egg cartons and keep a toddler busy for at least an afternoon - just remember to never smile at a crocodile. Eat your way through thirty six eggs (savor those omelettes, french toasts, and custards along the way), and be sure to save the egg cartons. 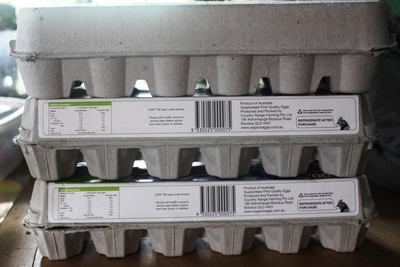 Take one egg carton and cut along half way through where the lid folds back. Then make some triangle shapes to form teeth - this will form the crocodile's "jaws". Next, make a hole in the other end of the crocodile's "jaws" and poke some string through the hole. 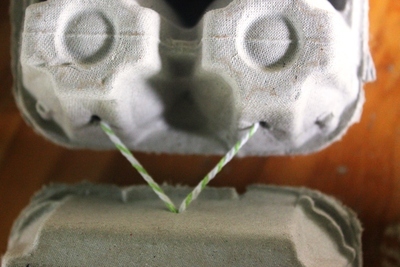 Join the string to the second egg carton and tie them together tightly, (turning it upside down and poking holes through it first). This will form the crocodile's "tail" and "body". Take the string and tightly tie the third egg carton (upside down) onto the top of the other two, to form the crocodile's "back" and "head". If you tie it together well, the crocodile will be able to with stand extra wear and tear at the end. Now for the really fun part for small children. They get to paint the whole thing green and glue on two crazy "googlie" eyes. When your crocodile's fresh coat of paint has dried off, it's ready for action. Snap, snap, snap. Have fun. What a great idea - this crocodile looks great.